As was heavily showcased in the fantastic opening ceremony with the appearance of Sir Tim Burners Lee; the World Wide Web and perhaps more prominently, social media, now play a big part in the Olympic Games. The motto for the Olympic games is “Inspire a Generation”, but how to inspire the Digital generation? Well the Olympics Games organizers have certainly inspired their online audience. 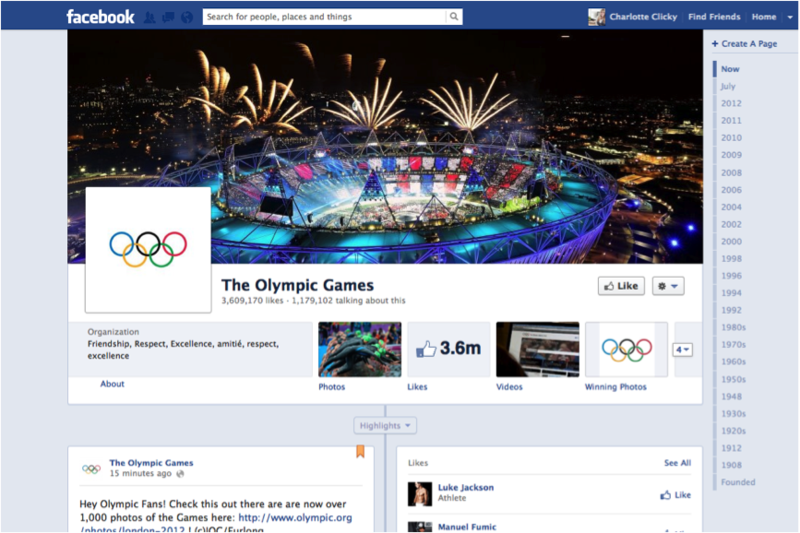 Below I have explored several Olympic Games online presences and outlined their many wonderful features. The real question now is how these social presences can inspire you; many of these features would be applicable to many and varied businesses. Tweet us to let us know which ones appeal to you (@PPLSmedia). 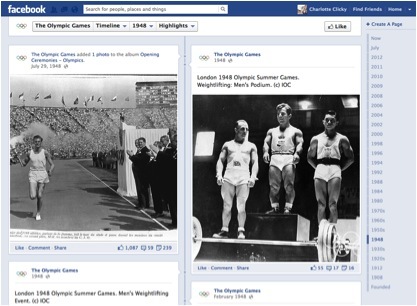 This is the official Facebook page for the Olympic games as a whole, and makes much of the esteemed heritage of the games, using Facebook’s Timeline feature to go all the way back to 1894. It’s a fantastic way to browse through the history of the games with various old photos and stories leading you back through Olympic legacy. There’s also a daily photo competition giving fans the chance to win tickets to the games – a prize indeed! Just upload your best Olympics themed picture and the best one of the day will win tickets. It’s a fantastic competition and it’s really getting people engaged with the games. This Facebook page, being purely about London, has the advantage of allowing mobile Facebook users to check-in at the Olympic Park. This is great as it allows lucky ticket holders the chance to tell everyone that they were there; a proud boast! Location check-ins are a standard feature available to all Facebook pages. What’s not standard, is the fantastic Social Game in this Facebook page. 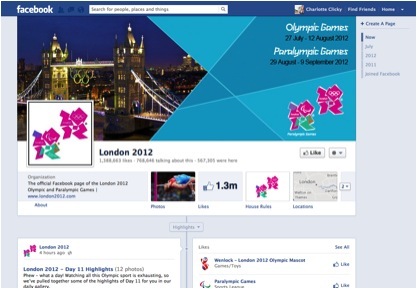 London 2012′s Facebook page has gone a step further in engaging their social audience by developing a social game that sits within their Facebook page. The game itself has been running for a long time with the intention to get people excited about the games coming to London, and so in the game you gradually build up your own Olympic park (it’s a bit like Farmville for the Olympics). 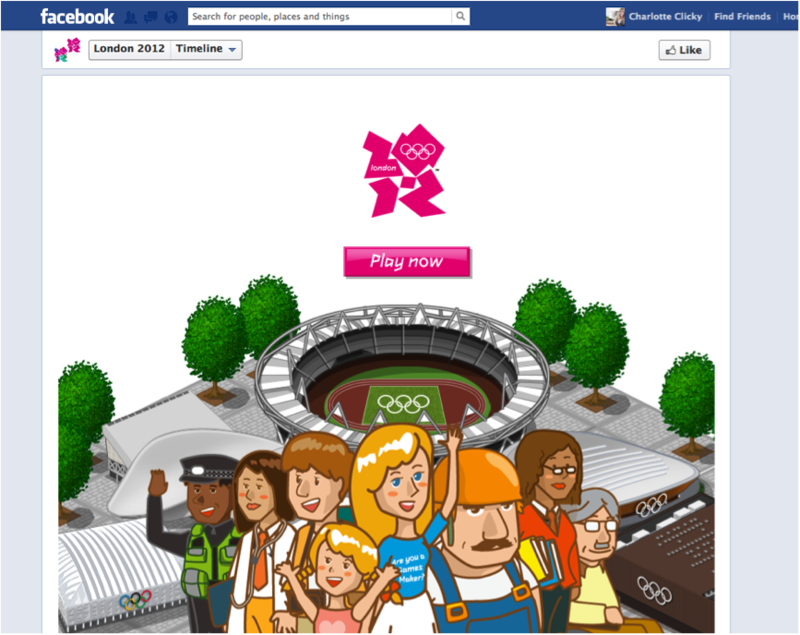 This is absolutely superb as you can share each element of game play with your Facebook friends to spread the word and get more and more people involved (and subsequently more excited about the then future arrival of the Olympics in London). 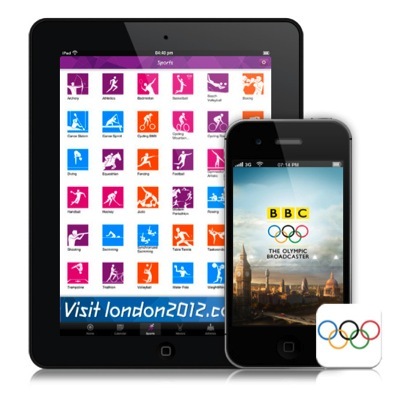 Want to keep up with the Olympics on the go? There’s an App for that! There are many Olympics apps around, and though there’s much debate about which one’s the best, I’ve decided to review the Official London 2012 results app. Incredibly useful if you can’t watch the Olympics live, it gives you real-time updates on the medal table and the most recent results. In addition, if you want to find out anything about a particular event, for example the time it’s on, the sportsmen/sportswomen competing and where it’s taking place, it’s all at the touch of the screen. All apps for the Olympics are aiming to prove similar purposes, and so it just goes to show how much people value this information at the fingertips, and increasing whenever and wherever they are. The rise in mobile has been staggering and it certainly hasn’t bypassed the Olympics.